Snippets of Jack: "A Dress Or Nothing"
Jack: "Come to join my crew? Welcome aboard!" Elizabeth: "I've come to find the man I love." Jack: "I'm deeply flattered, son, but my first and only love is the sea." 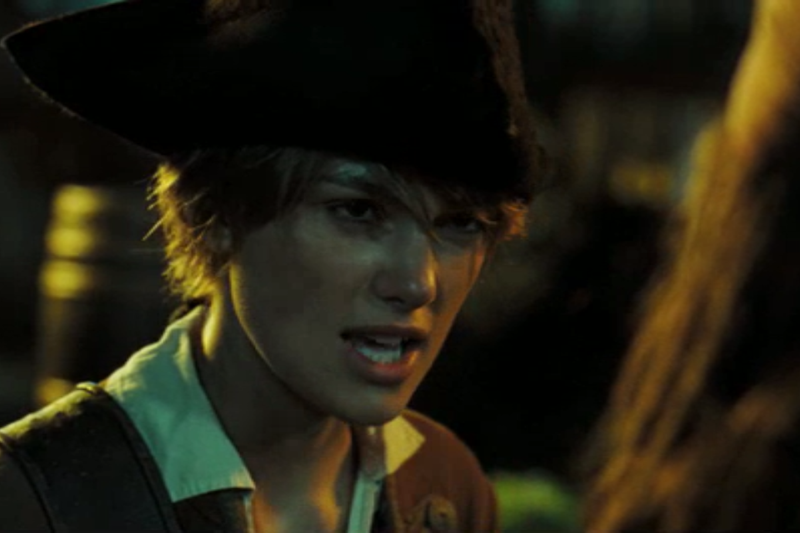 Elizabeth: "Meaning William Turner, Captain Sparrow." Jack:"Elizabeth? Hide the rum. You know, these clothes do not flatter you at all. It should be a dress or nothing. I happen to have no dress in my cabin." In this scene of The Pirates of the Caribbean: Dead Man's Chess, Elizabeth finds Jack boarding up his ship in the lovely port of Tortuga. Elizabeth, who is disguised in men's clothing, sneaks up on him. Jack, realizing that it's her, quickly hides all his alcohol, remembering that last time they drank together, Elizabeth burned all the wonderful rum. Then of course, he has to hit on her, as she's looking for her fiance. Well, clearly Jack prefers pretty Elizabeth or inappropriate Elizabeth, and doesn't have a problem with showing it. Of course, he learns better later in the movie when Elizabeth tries to kill him while kissing him. Realizing that Elizabeth is serious and wants to find Will, he completely lies to her about how Will got into danger. "Darling, I am truly unhappy to have to tell you this, but through an unfortunate series of circumstances that have nothing to do whatsoever with me, poor Will has been press-ganged into Davy Jones's crew." But Jack is allowed to lie, because he's just that cool right? When James Norrington, Elizabeth's previous fiance, objects to Jack's lie, Jack becomes a five year old. "You smell funny." 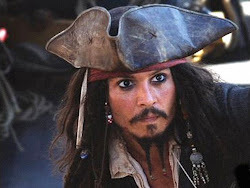 I don't think anyone in this scene really appreciates how amazing it is to be in Captain Jack Sparrow's presence.